There are 2 different lamps (1st and 2nd generations) available for your TV model but only one of them fits into your TV. Please look at the opposite side of the front bulb in the following photo and compare with the appearance of the lamp from your TV. If the housing of your lamp (smooth surface without silver metallic sticking out part) is same as the right-hand one (BP96-01073A), the lamp on this page is what you are looking for. 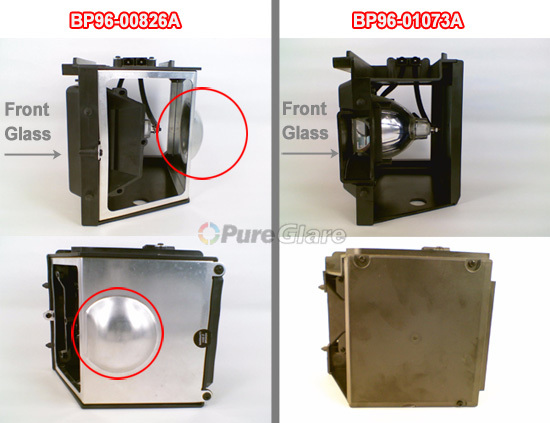 If the housing of your lamp (with silver metallic sticking out part) is same as the left-hand one (BP96-00826A), please search "BP96-00826AA" and purchase the correct lamp for your TV (your TV model may not be showed on the next page but it's compatible with your TV).